Admission this year is $10.00 a day, $15.00 for 2 days, $25.00 for a 3 day pass. Please wear your bands. There will be no drop off and then park. Please park and if you need help getting to the gate, someone can pick up and take you through the gate. NOTE: There is an admission fee at the gate EVEN if you are just coming for the auctions. Please do not give the people at the gate a hard time they are volunteers and just doing their jobs! Golf carts are for staff and handicap only, please. We will not be renting them out this year. 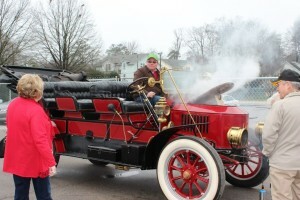 If you need one please call Carolina Carriage (910-295-0574) and make arrangements to rent one. There are a limited amount of carts available. There is no camping in the field so please don’t ask. We will have a limited amount of area for camping but we let those working and showing have first chance at them. The camping is self-contained only. Tractor Pull-OTTPA, Inc will be the host. Jim Bingham is in charge of that. Come sign up and give it a try. If nothing else, come to watch. And we can’t have a tractor show without tractor games, so look for those too! Make this your vacation destination! If you want to see a true representation of our American mechanical past you will not find a better display of history in the country. The Eders put on a display like no other, make this your vacation destination! Awesome show, weather, a little rainy at times, but show continued. International, was a highlight and Chapter 42 had many tractors, trucks, mowers and memorabilia items on display. Caterpillar had many items there as well. The steam tractors and threshers, well I have never seen a collection like this anywhere. Trains, pedal tractors, it was great. The food vendors were good, their selection and food was assume. Looking forward to 2016. You get my 5 star GREAT SHOW rating. How often do you see a steam powered sawmill?? I really enjoyed the 100 years of progress show. The part I like the best was the live demonstrations. How often do you see a steam powered sawmill?? The Parade of Power was fantastic. To see antique steam powered traction engines running is fantastic. There is also more equipment, tractors, trucks and other things then you can see in one day. Great place to visit, one of the most complete, comprehensive places to visit for all aspects of times gone by. Ederville, located in Carthage, North Carolina, is proud to be the best tractor and train show on the east coast! Join us every fall for fun filled, three day, family event! Tractor parade, games, antique auction, money in the hay stack and much more.